Hellooooooo summer! Just the mere thought of lazy summer days makes my heart incredibly happy. Whether you are going on a family picnic or BBQ gathering, at some point in the summer you may need to make a dish that will feed a crowd. This summer fruit salad will be your go-to dish to make and take with you all summer long. 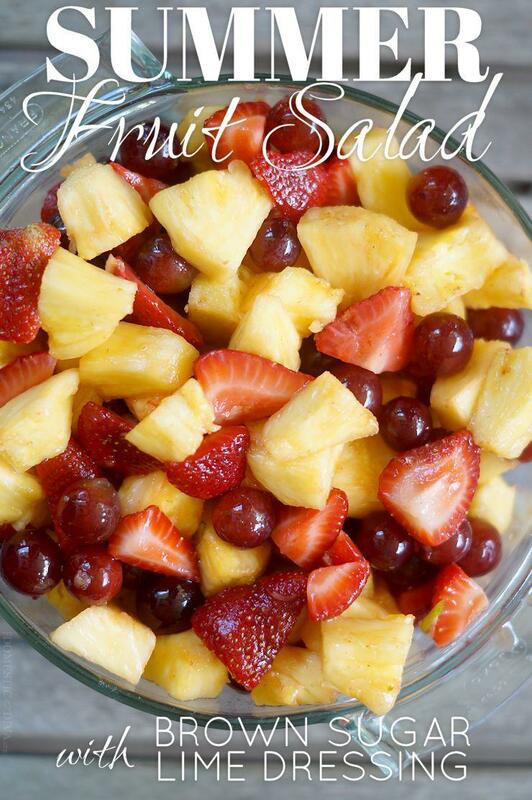 It is super simple to put together using fruit you may already have on hand in the fridge plus the brown sugar lime dressing is sure to be a crowd pleaser. Before you know it you’ll be packed and ready to go on your next adventure with a deliciously light and refreshing summer fruit salad in hand. In a large bowl, place one pint of quartered strawberries. Sprinkle the strawberries with brown sugar. Toss to coat and set aside for 5-10 minutes while you prepare the other fruit. Once all of the other fruit has been cubed, diced, or cut into chunks add them to the bowl of strawberries. Zest 2 limes and squeeze juice onto the fruit. Toss until everything is well coated. Serve. Can be covered and stored in the refrigerator up to two days. As the fruit salad sits the brown sugar and lime dressing draws out the natural sweetness of the fruit. Toss before serving. What makes this summer fruit salad incredibly delicious and unique is the brown sugar lime dressing. The lime adds just a hint of tartness and freshness to balance the sweetness from the fruit. One taste and you’ll be hooked. This summer salad is on steady rotation in my household all summer long. When fruit is abundantly in season during the summer months there is no better way to please a crowd. What a delectable combination! Thank you for sharing your healthy and delicious Summer Fruit Salad with Brown Sugar Lime Dressing recipe with us at the Healthy Happy Green and Natural Party Blog Hop. I’m pinning and sharing. I must try this! Looks delish!